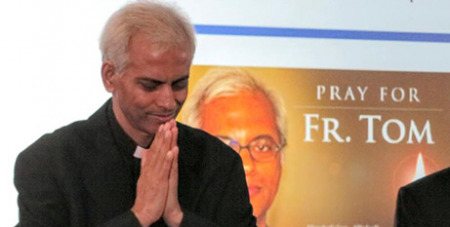 Fr Tom Uzhunnalil, the priest who was kidnapped in 2016 and held captive for 18 months by terrorists in Yemen, said his ability to persevere “was thanks to the prayers of everyone” who interceded for him. Source: CNA. A Salesian missionary, Fr Uzhunnalil first garnered the world’s attention when he was kidnapped during an attack on a Missionaries of Charity home in Aden, Yemen, that left 16 people dead, including four religious sisters. He was freed September 12, 2017. “The churches in Yemen had been attacked and vandalised, but in the days prior to my kidnapping the situation had stabilised somewhat,” he said. However, on March 4, 2016, when he was praying in the chapel of the Missionaries of Charity, he heard gunshots outside. He saw jihadists killing four of the sisters. “A little later they opened the door again and threw in something metallic wrapped in some cloth. I knew that it was the tabernacle that the sisters had in the chapel,” he said. While Fr Uzhunnalil said his captors did not physically harm him, he did suffer psychological torture. In the 18 months he was held captive, Fr Uzhunnalil relied upon prayer for perseverance. “It was thanks to the prayers of everyone who prayed for me that I was able to endure what I was going through. It wasn’t because of my personal fortitude but because of the prayers of my brothers and sisters in the faith,” he said.